There are many ways to make money in ArcheAge but delivering trading packs is one of the most interesting. A Trading Pack is a package of goods created by a player with the "Commerce" profession. Once the pack is made, your character carries it on his back and can deliver it to the other location in order to sell it and make money. As you can see, the general mechanics are simple but many players see it as a difficult way to earn gold or Gilda stars. I don’t think so. If you know what to produce and where to deliver it, "Commerce" can bring you a lot of money. 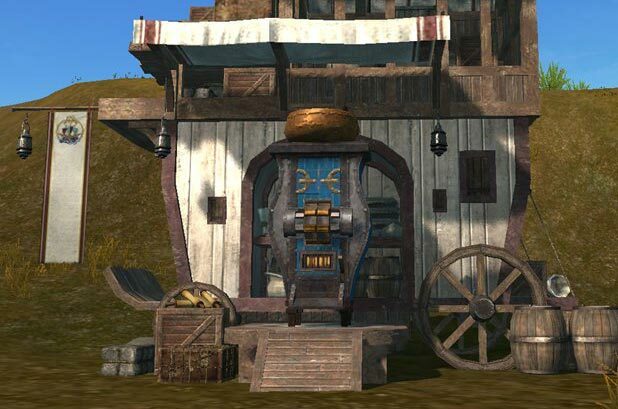 This guide will help you to understand the mechanics of Commerce in ArcheAge. The first thing you need to know is how to create a package in order to sell it for profit. First of all, you need a special Merchant Certificate. This certificate can be bought for 50 silver coins from the Crafting Merchant. You can’t craft a package without it. After you get the certificate you need to gather resources for crafting. Different packs require different resources and a list of required resources can be found in the "Commerce" crafting menu. After you collect enough resources and have purchased the certificate you need to find a special workbench. The easiest way to find a workbench is to use map. Open your map and tick Infrastructure - Speciality Workbench from the filters on the right. This will display what you need. All crafting actions in ArcheAge require labor power, and "Commerce" profession is no exception. Each pack created will cost you 60 labor, thus if you don’t have enough labor you won't be able to craft. When a pack is finished it restricts your character, decreasing their movement speed. This makes you an easy target for all ranged enemies. Due to your restricted speed they will attack you with their abilities from distance giving you a disadvantage. If you want to kill an enemy It’s better to place packs on the ground. You can drop a package on the ground but any other player can pick it up. You can also pick up the packs of other players. If you wish to keep your packs safe you can drop it on special territories protected by a scarecrow, farm or house. This territory can be used by your character and other characters who have access and can’t be stolen by other players, but if you don’t pick it up in 6 days it will disappear. You can also place it into a special box on a ship.A merchant ship has 20 boxes, Galleon and Tractor – 4 boxes. Only members of your party are allowed to take packages from a box. On the territory owned by other player, if you don’t have permission to use it. On the deck of a ship. In the sea. If you get killed in the sea or a ship with your pack in a box was destroyed, all packs will be dropped and any character can pick them up. It’s the main basis of piracy in ArcheAge allowing players to rob each other. After the package is created your character carries it on his back. Now the task is to deliver it to the other province to sell it. But there is one difficulty: like explained earlier, your movement speed with goods is very slow. It's not a good idea to move on foot, and that’s where a mount will help you a lot. Many players prefer to use horses to deliver cargo as they think that a horse is the best mount for this. But it's a big mistake guys! There is a special mount for merchants – donkey. A donkey is one of the best mounst for delivering trade packages because of it's movement speed. Just compare: if you carry a trade pack your horse will move 1.8 m/s while a donkey moves at 4 m/s. A donkey’s basic speed is over two times as much which makes a huge difference. Moreover, donkey's have a special skill that increases their movement speed by 30%. Which makes them even more superior to horses. The reward you receive for delivering your pack depends on the remoteness of the buyer from the place where you made the pack. You gain the most profit when delivering to another island and a ship will help you a lot. In fact there is a special ship for merchants called a Merchant Ship. The difference with this ship is that there are 20 Trade Pack storages there. You can place your pack in storage and thus defend your ship from pirates much better. Pirates are a real threat for all traders and if you are alone you have very little chance to complete your deal. Therefore, it’s better to gather in a group to better protect your cargo. If you have a Merchant Ship you should ask your guild mates to help you with delivering to protect against piracy. Big guilds usually gather in a large group to protect their merchants. If you are defeated by pirates the chances to get your goods back are low. When they destroy the ship all cargo from the boxes will be dropped and pirates will be able to pick it up. As you can see, the risk of losing goods is very high and I don’t recommend you deliver goods to another continent if you don’t have enough people to protect your ship. Some players say that delivering goods is one of the most profitable activities in ArcheAge. If you know what to produce, how to deliver goods and where to sell them, the "Commerce" profession can bring you a lot of money. But you should know some basic rules to understand the mechanics of making money. Trading Packs can only be sold in other locations. You can’t sell it in the location where you produce it. Thus you will always have to go to other territories. The reward you get depends on the remoteness of the buyer from the place where the pack was made. The further a buyer is located the more money you make. Very often you will get the highest reward for selling a pack on other continent or Freelich. It’s a risky journey but the reward is worth it. The reward decreases if other players deliver too many packs similar to yours, in the location where you want to sell it. For example if there is a great supply of lumber packs in Sanddeep you will get lower reward. If you are looking to maximize profits it’s better to choose a place with a stable economic situation. Or, you need to be fast, and lucky, to deliver your goods faster than other players. Trade Packs can be delivered to special NPCs - Gilda Star Trader and Gold Coins Trader and can be exchanged for Gilda Stars and Gold. You can find these NPCs using your map; just filter Merchants - Gilda Stars Trader / Gold Coins Trader. These traders are usually not far from each other. If you sell packs for gold you receive it 22 hours after the transaction with a 5% gain. If you sell them for Gilda Stars you receive the reward immediately. There are 6 locations on each continent where you can sell packs. You can also deliver them to the Freelich Island. Your faction also affects the efficiency of Commerce. If you play as a Western continent member the most profitable place for selling packs is Freelich Island. If you are a member of Eastern Continent the highest profit can be received from delivering to the southern regions of Western Continent. NOTE: List of Trade Routes was updated.